Being careful not to incorporate trends on fixed surfaces will ensure that your kitchen won't look dated. Fixed surfaces include: countertops, cabinets, backsplashes and flooring. You're saying wait Jennifer, that's everything, right? ..no it isn't because easily changed things like stools, lighting, hardware, and window treatments are the remainder that can bear trends. I was fortunate enough recently to attend the KBIS (Kitchen and Bath Industry Show) in Las Vegas with designhounds as an Influencer. There I got to see trends and new introductions. 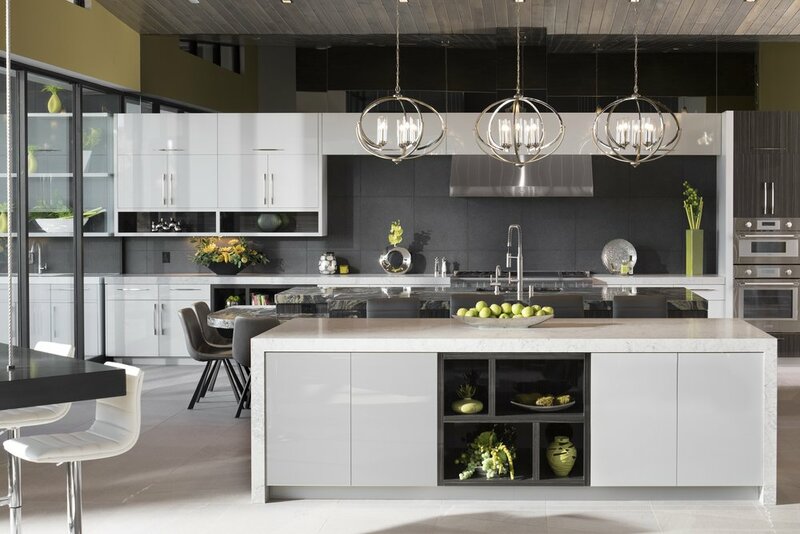 See my previous blog post about 5 trends for kitchens and baths for 2019. I was also invited by one of our sponsors, Caeserstone to the New American Home located in Henderson. Here is our fabulous group Designhounds at the home (minus a few). Can I say spectacular? Views of the city of Las Vegas, infinity pool, a home that opened up completely to the desert patio. A cool surprise was the models that they painted to represent their finishes. I literally had a freak out moment when she opened her eyes!! This is Caeserstone’s Noble grey on top of the fireplace and Vanilla Noir for the hearth, which seamlessly runs outside on the patio. Ok, now we are over the shock and amazement. Here’s a case study. Let’s look how the perfect pairing can work with appliances and countertop finishes…. another sponsor, Thermador , had appliances in The New American Home by Caeserstone. It totally makes sense in this scenario as the kitchen as a whole was very streamlined. The refrigerator, oven range and hood all go with this style of kitchen. Notice the clean lines that are repeated in the countertop from the appliances. Like Sonny and Cher, Peanut Butter and Jelly, they just work together. The new finishes are reminiscent of nature, stone and concrete, and paired with the appliances they share similar attributes. In the above photo, Caeserstone has installed the Montblanc countertop in a waterfall edge and it looks very sophisticated and modern. Notice the different countertop materials being used throughout this home, it still creates a cohesive look, because the tones and style are close in nature. Thermador Home has some spectacular offerings for some nice looking wall ovens, ranges and hoods that pair nicely with this aesthetic. Thermador’s professional collection offers: steam, speed and convection in one!! The cabinetry and appliances are on the same plane and therefore look like a seamless design. The appliances are still visible, but they don’t look so stand alone. This makes it very appealing for modern interiors. We are getting away from the traditional idea of the kitchen as a very utilitarian space and it is now part of the design of the home. Like you see below, the Thermador wine refrigerator fits in nicely in this cabinet. Thermador’s wine columns are home connect enabled. They can be controlled remotely and can even give you the perfect wine pairing…how’s that for smart?? This is just one example of a beautiful pairing. 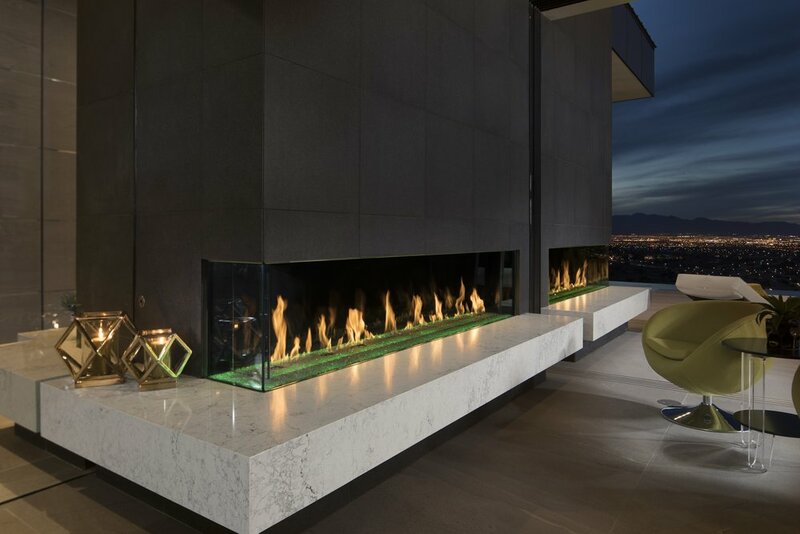 Both Caeserstone and Thermador Home offer different lines that work together for any style. You can easily take these countertop finishes and appliances and pair them with a traditional kitchen. The cabinetry in this case would be more of a decorative element. Thinking about all your elements in your kitchen this way creates that cohesive look throughout your space. This home is a perfect example of attention to detail and pairings that work. Speaking of pairings, my Pinot Noir is calling my name…and it’s not going to drink itself.